short girl, long island. : Teach Me Something Thursday, Volume Ten. This week's TMST comes from Shanna, the blogger behind Because Shanna Says So. 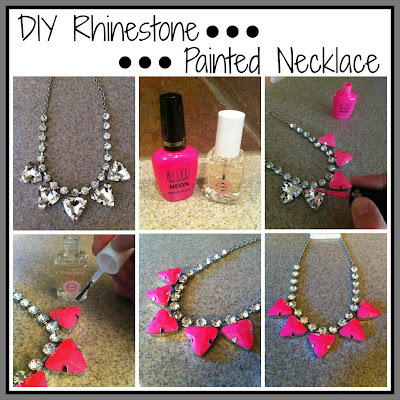 She shows you how to take an inexpensive necklace + nail polish to transform the piece into something your own! Statement necklaces. We all own them. We all love them. We all are on the hunt for them. I thought, why don't I make my own? Well, not actually "make" a necklace, but take a clear and simple rhinestone one and make it my very own. I posted the original necklace on Instagram and the feedback I recieved was, paint it PINK. So, my friends, that's what I did. It just so happens that I don't own a neon pink necklace, so thanks for reading my mind! I am far from being a DIY kind of girl. I can't even tell you the last time I attempted this sort of craftiness. So, this was BIG for me even though it only entailed three easy steps. 1. Paint one coat of polish on the rhinestones. Brush downward. Let dry. 2. Paint a second coat of polish. Let dry. 3. Apply Essie 3-Way Glaze to the stones. This will help give shine and even out the color. Easy Peasy Lemon Squeezy. Right? I must admit that I LOVE it. I want to make more and plan on hitting up Forever 21 to see if they have any left in the store. I knew I should have bought two or three. Kicking myself. Here is one way that I styled it. I can't wait to wear it again and again and again. Who would have thought that I could get DIY supplies at Forever 21 and Ulta? This is my kind of crafting. Are you ready to try it for yourself? What color statement necklace are you missing? If you would like to participate in Teach Me Something Thursday, feel free to contact me to schedule a date for your feature! I am currently booking for 2013. I absolutely LOVE this. I am ordering this necklace now and making it exactly the same! What a great idea! very cool necklace! simple and pretty! even I can do it!